In 2010, OFAC assessed fines and penalties in 24 cases totaling $200,735,996.Among those penalized were entities that extended credit, sold goods, or provided services to SDN List individuals.OFAC is actively investigating a number of auto dealers, along with other entities. 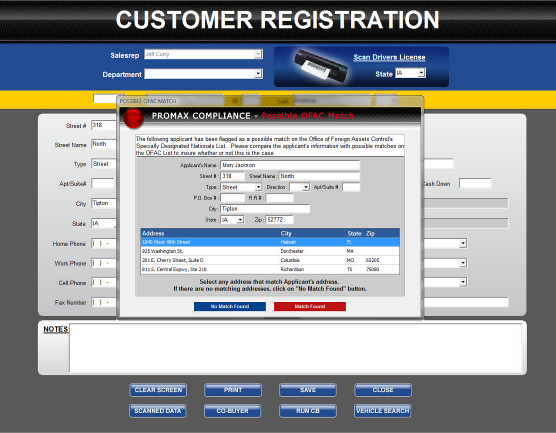 Logging a customer from any screen in ProMax initiates a OFAC screening. If there is a potential match, the user is alerted and given comparison data to review. If a possible match is found, the user is able to compare the current applicant’s information to the SDN List information for verification. Instructions are provided to the user for contacting the hotline and a link is provided for more OFAC reporting information. Automatically Date & Time Stamped! OFAC matches, along with all other compliance and customer interaction is permanently recorded on the Customer Workscreen. If you’re audited, or receive an administrative subpoena, you’ll have all the necessary information concerning the transaction in question. Incident reports are permanently recorded on our compliance summary report. ProMax makes complying with the OFAC screening and reporting process incredibly easy. 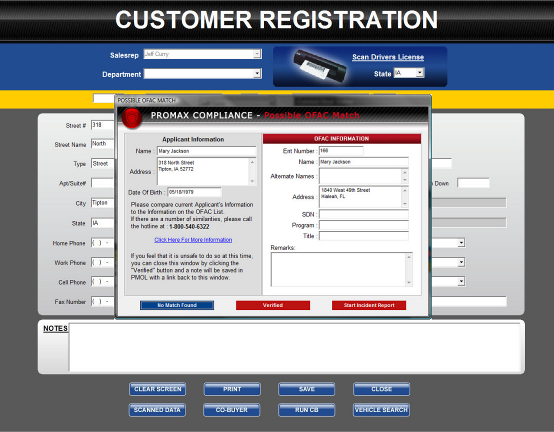 We scan every customer you enter into ProMax as soon as the customer is logged. If you receive a potential “hit”, we provide a simple verification process for verifying the possible match. If there are several similarities, we provide the hotline number to your staff.